We took my grandson to the fair last week to see the sights. While we were there we sampled some of the fair food and rode the tractor shuttle a few times. He also got to ride on a real pony. I stopped off awhile to take a look at the quilts. I asked the ladies at the desk for the names of the entrants, but they no longer provide a list. So here are the quilts that I saw. Most of them are behind glass, so the photos aren't great. In most cases, the quilts are folded so only a small portion of them is visible. This Sunbonnet Sue was very well done. The cathedral window quilt won second place. The baby quilt in this case was hand embroidered. I really like this medallion quilt. This quilt has some of the license plates that were given out during the Row by Row Experience. This quilt won for hand quilting. The photo does not do it justice. This one was hand quilted as well. Farmer's wife quilt (I think). I believe this quilt was the only hexagon quilt. I've noticed more and more hexagon quilts are quilted like the one below: pebbles in the center with a feather quilted around the hexagon rows followed by pebbles in the path between the hexagons. I think this would be faster than quilting each individual hexagon. I thought it was interesting how this quilt used the quarter Dresden plates. This was an oil painting that won a 4th place ribbon. I couldn't stop looking at it. That lion looked so realistic. I should have taken more photos of the fair. I hadn't been there for over 10 years. There was a lot to see, and I when it was time to leave I realized my camera had been in my purse almost the entire time. I've been working on some projects that I've committed to for a couple of functions and others that are on my list of UFOs. I'll have more to show you next time. Hello Everyone I didn't intend to take a blog break, but I guess it happened anyway. I've had a busy two weeks and have been enjoying summer. I have pieced the scrappy 1" hexagons that surround the center medallions of my Brinton Hall quilt. The quilt pattern for Brinton Hall is published in two parts in Quiltmania magazine #107 and #108. 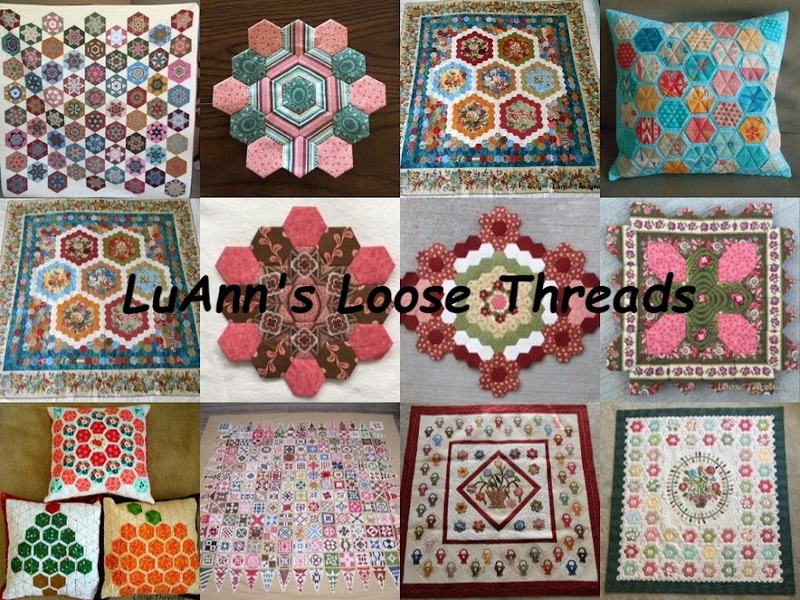 My next step is to sew the scrappy hexagons onto the center and then add the border. My nephew was married in a beautiful garden ceremony a couple of weeks ago. We were able to spend several days with family from out of town. Then a quilting friend, Nancy M., had a group of us over to her beautiful home for 3 days of sewing, talking, and eating (and not necessarily in that order). 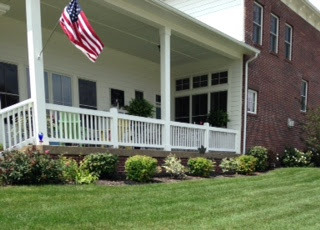 Here is one of the porches where we spent time during our retreat. Here is another porch where we had dinner our first evening. Nancy's home was filled with quilts - both antique and ones that she has made. Here are just a very few of them. This one is a Piece O' Cake design. Here are two quilts in one of the upstairs bedrooms. This was where I slept. I don't know the pattern, but I love the quilt. This is Nancy's version of the Happy Village done in a Halloween theme. This technique looks like fun. When I get caught up (whenever that is), I would like to try making one of these. Nancy also makes postcards to send to her friends and family. She was working on these Valentine postcards at our retreat. She gave me a tutorial and after looking at her supplies, I've started collecting things to make a few postcards of my own. I can't tell you how inspired I am after spending time with this group of quilters. Somewhere in the last couple of weeks I pulled some Christmas yarn out of my stash and started to crochet another Granny Stripe Afghan. You can find my pattern on my crochet blog here.